﻿The company raised $38 million in March 2017 and is cofounded by Harvard geneticist George ChurchGeorge Church and Luhan Yang. Their research is focusing on removing certain genes in pigs that could cause diseases or organ rejection in humans, making it possible for those pig organs to be transplanted. eGenesis announced in the journal Science that it had produced 37 piglets that had inactivated Porcine Endogenous Retrovirus, or PERV. ﻿The company raised $38 million in March 2017 and is cofounded by Harvard geneticist George Church and 31-year old Luhan Yang. Their research is focusing on removing certain genes in pigs that could cause diseases or organ rejection in humans, making it possible for those pig organs to be transplanted. eGenesis announced in the journal Science that it had produced 37 piglets that had inactivated Porcine Endogenous Retrovirus, or PERV. In August 2018 eGenesis has disclosed $40m in funding by ARCH Venture Partners, Biomatics Capital Partners, Khosla VenturesKhosla Ventures, and Fan Ventures. ﻿eGenesis' state goal is to make xenotransplantation a routine medical procedure. The company is a Cambridge, MA-based startup that's using the gene-editing tool CRISPRCRISPR to make pig organs viable for transplants into people. In August 2018 eGenesis Bio has disclosed $40m in funding by ARCH Venture Partners, Biomatics Capital Partners, Khosla Ventures, and Fan Ventures. 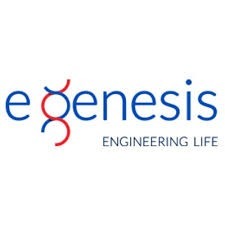 eGenesis Bio has disclosed $40m in funding by ARCH Venture PartnersARCH Venture Partners, Biomatics Capital Partners, Khosla Ventures, and Fan Ventures. eGenesis Bio has disclosed $40m in funding by ARCH Venture Partners, Biomatics Capital Partners, Khosla Ventures, and Fan Ventures.